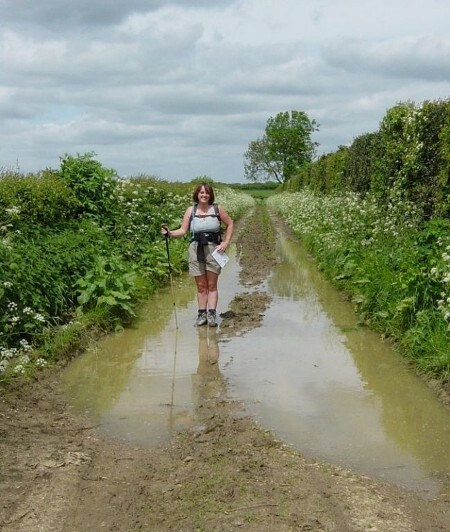 May 7th - Day Walk, Hollingbourne to Thurnham Castle and back. It's May and we still cannot trust the weather forecast, expecting rain but not wanting to stay indoors and with new boots waiting to be tried out we decided to have a short afternoon walk along the North Downs and revisit one of the areas where we had struggled a little from doing too much in one day and also taking time to take a detour to see one of the monuments that the trail passes. Starting at Hollingbourne we started in the now customary fashion of heading uphill and onto the top of the Downs. When last walked along here were were both tired and worn out after a tiring day walking in the mud up and down hills from Rochester. Now the forest floor was covered in bluebells and the smell of these mixed with that of the Ransoms, Wild Garlic, wafted across on the warm air. Butterflies flittered about and bees were busying themselves amongst the blossom. It was a day for taking your time and just taking in the views. The route is quite easy to follow and direct, although there are some stepped descents and climbs to test out the stamina and new boots! However we did come across the North Downs answer to Everest's Hilary Step - Lizzie's leap, a stile that on one side was so high Lizzie could barely see over the top! A group of young cubs - the human scout variety not the slightly cute but aggressive foxes - heading in the opposite direction asked whether there was anywhere ahead where they could sit down for a rest and have their lunch which made us both think about the day we were tired and in need of somewhere to sit down, unfortunately there aren't any handily placed seats along this stretch so all we could advise is that they find a nice bit of grass. When we arrived at Thurnham we took a detour to the remains of a castle on top of hill - the trail takes a path lower down, so we missed the castle when we passed this way before - taking our own advice we sat down amongst the ruins and unusual breed of goats for a rest in the sun, Lizzie only managing to get one sock off before dozing in the heat. We had planned to return to Hollingbourne using paths along the valley at the bottom of the Downs but as we were enjoying being up on the top of the downs we decided to take a path heading through a recent access area at White Horse Hill and rejoin the North Downs Way above Cats Mount - hopefully missing out some of the ups and downs. Unfortunately things did not go to plan, we got lost. Not sure how but we did manage to find ourselves back on the North Downs Way but not quite in the right place so we still had a few steps to deal with on the way back. An attempted Circular walk, After looking at the local ordnance survey map we planned a long circular walk based around one of the best sections of the North Downs Way going from Wye to Etchinghill before dropping down off the downs and using some of the footpaths shown on the map to make our way back to Wye. It all looked so simple on paper! The initial 11 miles along the North Downs were very easy on the eye passing through some of the scenic highlights of the whole long distance route - Wye Downs, Devils Kneeding Trough, the hills above Postling and Tolsford Hill. Great views but after a week of constant rain many of the trackways were flooded and had been churned up by cattle, so not so easy on the foot. At Tolsford Hill we left the established waymarked route and headed off towards the more rural landscape in the valley below. At first we took advatage of a lengthy section of trackway which whilst not being very interesting did provide some easy walking in the right direction back towards Wye. A cuckoo sang as we headed towards Cuckoo Lane. Then we hit our first problem, the small path we had hoped to take to away from the trackway didn't appear to exist anymore, so we carried on the trackway reaching a minor road and walking back up to this to rejoin our planned route at the point where the small trackway should have also joined the road. No sign of the small path from the road and a new electricity sub station had been built at the point where according to the map it should have been, so we were probably wise to have taken the long way round. More trouble presented itself on the other side of the road, the footpath was marked but not really distinct and the field we were walking in was fenced in all around, so no visible means of getting out. As the path was indicated on the map we decided to continue and see what happened finding a piece of fencing that had been torn away to give access to the next field, again no distinct path and this field was also bounded by electric fencing. 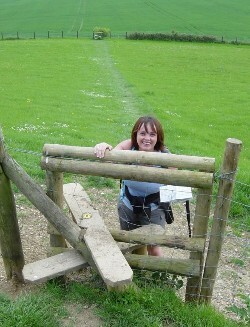 We could either turn back or look for some way across, eventually after walking up the fence-line and crossing the electric fence we came across a stile and path cutting its way through a field of wheat. No path visible in the next field but we could see the stile in the hedgerow opposite so walked around the field boundary and found ourselves on a track heading in the right direction before becoming completely hemmed in by a field full of rapeseed. The path should go through the field and there was a slight line marked in the crop - it appears that some of the farmers indicate the footpaths by killing off the crop along the line of the path, where the crop has died away they are quite clear, on this instance we walking through head high plants and emerged out of the other side slightly scarred with scratched legs and worn out. Lizzie could barely see over the top of the crops and had some difficulty making here way through. We eventually escaped onto a minor road and investigated the next path - it looked pretty much like the one we had just fought our way through so we abandoned our plans and headed back up the road to rejoin the North Downs Way. Today really opened our eyes to the problems in keeping footpaths open and accessible, if we gave up it is likely that other less experienced walkers would and eventually the footpaths will go out of use just leaving those that are part of National Trails. 23 miles later we hobbled back into Wye wondering whether it was worth devising our own circular routes again.